Pulkovo Airport (IATA: LED, ICAO: ULLI) is the international airport serving St. Petersburg, Russia. 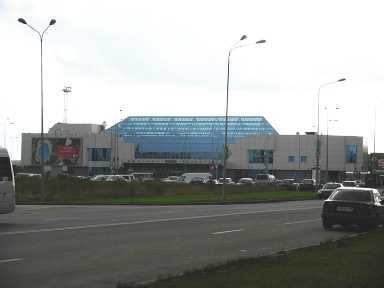 The Pulkovo-2 terminal is located about 17 km (10,5 miles) south of the city centre. The Pulkovo-1 terminal is located about 20 km (12 miles) south of the city centre. Construction began in January 1931, and was completed on June 24, 1932, with the first aircraft arriving at 17:31 that day, after a two-and-a-half hour flight from Moscow carrying passengers and mail. During the Second World War the airport was the frontline in the Nazi Siege of Leningrad. There were no flights between 1941 and 1944. The nearby Pulkovo hills were occupied by the Nazis and were used by the long-range artillery for daily bombardments of Leningrad. The airport was cleared of the Nazis in January of 1944, and resumed cargo and mail flights after the runways were repaired in 1945. In February of 1948, after the war damages were completely repaired, the airport resumed scheduled passenger flights. In 1949, there were scheduled flights to 15 major cities of the USSR, and 15 more short-range flights within the north-western Russia. In 1951 the airport terminal was redesigned to handle larger aircraft. In the mid 1950s the new extended runway was completed, allowing to handle larger aircraft such as Ilyushin-18 and Tupolev-104 jets. The airport was renamed "Pulkovo Airport" on April 24, 1973. The new Pulkovo-1 terminal was opened to handle the domestic air traffic, which increased 40%-50% every decade between the 1970s and 1990s. International arrival terminal Pulkovo Airport is the 3rd busiest in Russia after Moscow's Domodedovo and Sheremetyevo airports. While the number of domestic and international flights increased, the number of passengers grew from 4,837,000 in 1990 to just over 5 million in 2006, mainly due to the increased share of international flights. It is anticipated that by 2025 Pulkovo airport will handle 17 million passengers. There are two passenger terminals: Pulkovo-1 for domestic flights, and Pulkovo-2 for international flights. There is also one cargo terminal. There are forty-seven aircraft stands total. It is planned to increase the number of aircraft stands to 100 by 2025. The airport has two main runways. Runway 10R/28L, is 3782m long and 60m wide, it has asphalt surface on the base made of reinforced armoured concrete. This runway is the only runway in Russia equipped to serve the new Airbus A380. The second runway is 3410m long and 60m wide, it has asphalt surface on the base made of reinforced cemento-concrete. The reconstruction of the second runway is scheduled to begin in 2007. Terminal 1 mainly serves flights within Russia and the CIS countries. Some international charter flights are also served by Terminal 1, those are tourist flights as well as private business jets. For example the private jet owned by Steve Forbes was served at Terminal 1, and thousands of Russians witnessed its "Forbes - the tool of capitalism" logo proudly exposed on the body of 737. Terminal 2 serves most of the long-haul international flights. Terminal 1 was built in 1973, whereas Terminal 2 was built in 1950s and reconstructed in 2003. The design for the construction of the new international terminal is currently underway by a German company Hochtief AirPort GmbH. The new terminal will be located directly to the north to the Terminal 1 and will contain 18 gates. The construction is planned to begin in 2008 with scheduled completion in 2010/11. 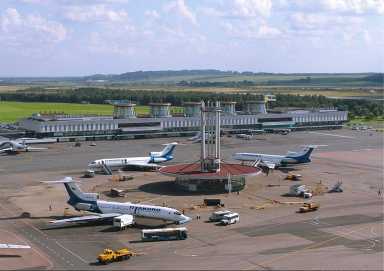 The airport is the main hub for Rossiya Airlines. The one-way trip from Pulkovo to Saint Petersburg using public transportation will cost $1 or less by bus. Rapid metro-bus known as "Airport bus" is connecting Pulkovo-1, Pulkovo-2 with three main underground metro stations Moskovskaya, Tekhnologichesky Institut, and Pushkinskaya in the centre of St. Petersburg. End-to-end travel time is about 30-40 minutes. Typical cost is US$3 per passenger, with extra charge per piece of luggage. These are typical "Marshrutka" minibuses, some of them following the city bus routes (and using matching line numbers). The line 39 serves Pulkovo 1, connecting it to metro stations Moskovskaya, Park Pobedy, Elektrosila, Moskovskie Vorota, Ligovsky Prospekt, Ploschad Aleksandra Nevskogo, Novocherkasskaya, Ladozhskaya, as well as Moskovsky and Ladozhsky rail terminals. Lines 3, 13, 113, 213 serve Pulkovo-2 (to get to the city use the stop closer to arrivals; the one closer to departures is going away from the city). Lines 13 and 113 connect to metro station Moskovskaya, line 113 proceeds on to Kupchino. Lines 3 and 213 connect to metro stations Moskovskaya, Park Pobedy, Elektrosila, Moskovskie Vorota, Frunzenskaya, Tekhnologichesky Institut, Sennaya Ploschad. Pulkovo airport is served by two regular bus lines: routes number 13 and 39. The stop for line 39 is located next to arrivals in Pulkovo-1. The stop for line 13 is located next to arrivals area at Pulkovo-2 terminal. Note that Pulkovo-2 has another stop for bus 13, for buses coming from the city, this stop is located next to departures area. The commute time to metro station Moskovskaya is about 15-20 minutes. Pulkovo airport is accessible via the nearby Pulkovskoe shosse motorway from St. Petersburg city centre. There are drop offs and pick up areas at both terminals, as well as short and long stay outdoor car parking. While the short term parking at the Pulkovo-1 terminal is abundant due to the larger space, parking might be a bit tighter at the international terminal Pulkovo-2. In the 1990s, Georgy Poltavchenko served in the department of transport security of Pulkovo as the representative of KGB Directorate of Leningrad and Leningrad Oblast. This page was retrieved and condensed from (http://en.wikipedia.org/wiki/Pulkovo_Airport) see Wikipedia, the free encyclopedia, January 2008.